Recently, based on the scintillation data from at low latitude station and the in-situ plasma density data from ROCSAT-1 satellite, researchers from the State Key Laboratory of Space Weather, the National Space Science Center (NSSC), Wang Zheng and Prof. Shi Jiankui, as well as other colleagues, provided evidence that scintillations can be associated with plasma blobs in the low-latitude ionosphere for the first time. In general, ionospheric scintillations at low latitude are considered as signatures of equatorial plasma bubbles. Based on analysis of signals, some studies suggested that the scintillation in the low latitude ionosphere also could be caused by the plasma blobs, but there was no in-situ measurement hitherto to confirm it. With GPS amplitude scintillation measured at Vanimo and the in situ measurement data from ROCSAT-1 satellite, the research group performed a case study on the concurrent observation of scintillations and a plasma blob observed in situ, and for the first time provides evidence of the view that scintillations can be associated with plasma blobs in the low-latitude ionosphere. The blob measured in situ had a scale size of about 800 km in F layer, and the ion density inside the blob was severely disturbed. The blob was mainly caused by O+ ion activity and was upgoing. The research group also analyzed the mechanism of scintillation produced by plasma blob, and suggested that the eastward polarization electric field should be associated with the plasma blob and its associated density disturbance which then causes the ionospheric amplitude scintillations. This study is significant to understand the process of the scintillation and the physical mechanisms and related phenomena of the plasma bubbles and blobs in the low latitude ionosphere. It is also important to the study on the scintillation-related phenomena and improvement for the scintillation forecast models. Figure 1： The ion density, ion composition, and three components of ion drift velocity measured by ROCSAT. The dashed lines indicate the blob, whose density was twice as the background. 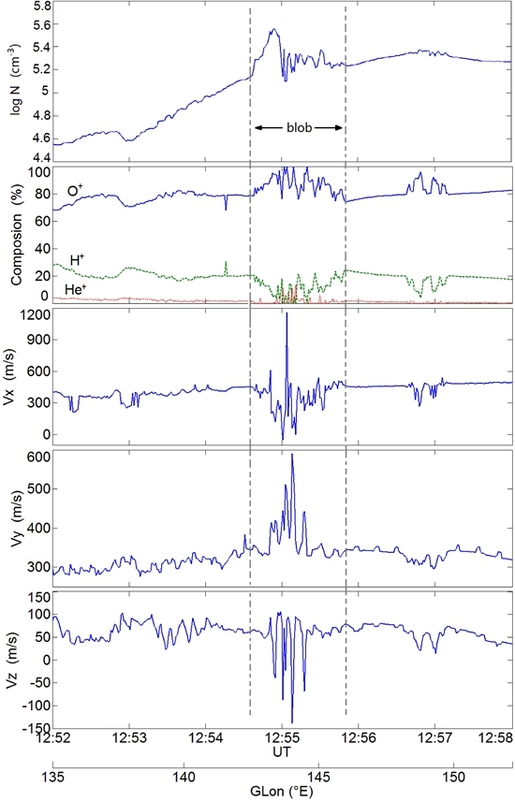 Figure 2： When the ROCSAT measured the blob, the ionospheric GPS scintillation monitor observed scintillations in three concerned GPS signals, providing evidence of the view that scintillations can be associated with plasma blobs in the low-latitude ionosphere.